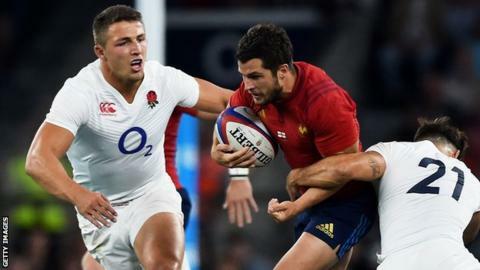 England head coach Stuart Lancaster has insisted centres Henry Slade and Sam Burgess are not battling each other for a place at the World Cup. The pair debuted alongside each other in Saturday's 19-14 win at Twickenham. Lancaster is expected to name four centres in his squad on 31 August, with the hosts beginning their World Cup campaign on 18 September. "There are a lot of decisions to be made but we still have two weeks to make them," he told BBC Radio 5 live. Brad Barritt and Jonathan Joseph are considered Lancaster's first-choice pairing at centre, with Luther Burrell also expected to make the final cut. It has been thought that would leave Slade, 22, Burgess, 26, and Billy Twelvetrees contesting the final berth. But the England boss said: "I've never really bought that. That's been created in the last week or so." Former rugby league player Burgess put in a tough-tackling performance on his England debut, but showed he is still adjusting to life in union when he was yellow-carded for pulling back France's Morgan Parra after a quick tap penalty. "Obviously he was disappointed to be sin-binned. It was an instinctive reaction," said Lancaster. "I've seen rugby union players who have played for years do the same thing." Matt Dawson's pick: Who should make the squad? "You can't take him to the World Cup for me," said former England scrum-half Dawson. "The great thing about Burgess is he doesn't make mistakes with ball in hand. "But unfortunately, if you're going to be really picky, positionally he wasn't great. He played like a six rather than a 12. There are things that are instinctive that he doesn't know what to do." Slade looked right at home in the Test arena, but has this World Cup come too soon? "Henry Slade looks like a young Brian O'Driscoll. He's talking to everyone. He fits really well," said Dawson. "If Henry Slade is not in the World Cup squad I will call Stuart Lancaster and say 'what are you doing man?'" "Alex Goode is pure class. He has an ability to dance on his feet and still see what is going on," said Dawson. "There are players that have to impress and step up and Alex Goode has definitely made Stuart Lancaster think 'he's doing things that Mike Brown doesn't do'." What did Twitter make of England?